Push or Pull | The Better Plan . .
Chris Sequiera, the author for today’s blog teaches History, Bible, Health and Geometry at Livingstone Adventist Academy in Salem, Oregon. He was a part of LAA shifting to school practices that emphasize choice theory principles and has been a master teacher for ITI – Integrated Thematic Instruction. Like many teachers, this summer I am taking summer classes. In my Middle Ages and Renaissance of Europe History class I am in the process of reading the works of Niccolo Machiavelli and Thomas More, specifically their works titled “The Prince” and “Utopia” respectively. Though written about 500 years ago, it occurred to me that King Solomon was right when he said, “There is nothing new under the sun.” I am not saying that either Machiavelli or More were closet Choice Theorists, but their political dialog does have an uncanny resemblance to the comparing and contrasting today of traditional and choice theory classrooms, tradition versus Quality School if you will. In introducing the concepts of Quality Schools, Glasser has us take a look at Edward Deming’s business model. In it he differentiates between boss managing and lead managing. As one education coach shared with me, as teachers our role is to be the guide on the side, not the sage on the stage. I also like the way that General Eisenhower illustrated the point. Placing a long rather large chain on the floor, he asked his leadership team how to best move it from point A to point B. There are two obvious solutions, attempt to push it across the floor, or to pull it. In critiquing the two methods, one finds that by pushing, only the links that are directly pushed are really affected, making the chain as a whole rather difficult to maneuver. However, if one were to grab the end of the chain and pull it across to the designated point you will find it much more effective. People, and students are people, are no different, not only would they rather be pulled than pushed, it is much more effective. 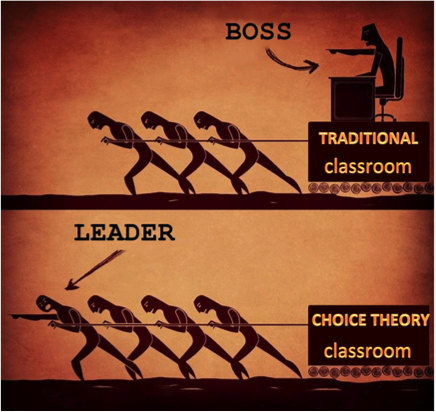 The Choice Theory classroom starts with this premise. Attitude – even before I step into the classroom, I need to evaluate what paradigm I am in, boss or leader. Direction – this tends to be a very grade level topic. As a high school teacher where I see a different group of kids every period it is much more work to provide a means of direction, a constitution, than in a self-contained classroom, but nonetheless student input – every year – is vital to them buying into how the class runs. Collaboration – statistically students learn more from each other than their teacher. I need to provide the most beneficial means to do that. How I seat my students, for instance, matters. Content – meaningful content is something that students don’t have to make too big a stretch to see its value; some topics/subjects are easier to do this with than others. Movement – the brain is an organ, an organ that requires blood flow. I need to ensure that my students are getting adequate blood flow to their brains. Choice – whether it is variation in the assignment or choices in projects, students buy in more when there is choice in what they do. Flexibility – in regards to time and amount of work done should to at least some degree be negotiable. As a student in an upper division college history class, I know I would appreciate that in my professor. Feedback – give students honest and immediate feedback on their work. Application – as a Choice Theory teacher it is not my job to ‘cover’ material, it is my job to ensure that my students have mastery. Commit – when students see how committed I am to their success, their commitment soon follows. There is more to being a Choice Theory teacher, but this is a great place to start and add on to. Have a super year, but enjoy the rest of your summer too! As I am getting ready for a new year in a new school, I am constantly thinking of ways to make my new classroom as inviting to the students as possible. Thanks for the great ideas for a starting point. I am excited at the possibilities at Thunderbird Academy. Great to hear from you, Paul. You are missed in northern California, but our loss is Thunderbirds gain. Wish you could have been a part of the Soul Shaper workshops this summer. Maybe next summer. Stay in touch. Better yet, what are the chances you, like Chris, would write for the blog? Great article, I believe as teachers we need to be leaders in the classroom by moving along with our students by providing ongoing feedback. Students will only excel in the classroom if they are supported and are given a comfortable environment so they can achieve excellence. As a teacher for the last 9 years, my goal is always to provide a comfortable environment where students will want to be and allow students to create new innovative ideas to see what they could to make this world a better place as we await the soon return of Jesus. Thanks for commenting, Luis. A comfortable, supportive environment is a key to a person’s success, be they in the classroom or anywhere.